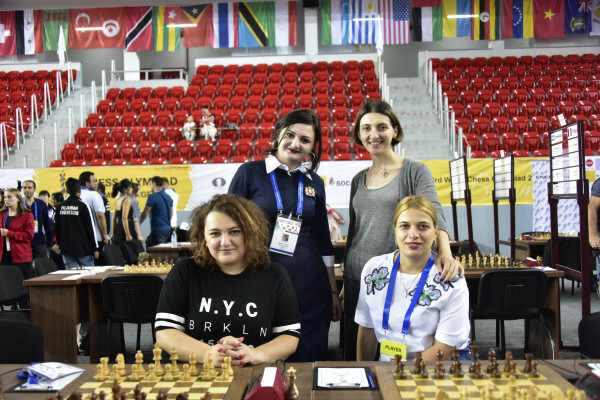 Georgian women’s team keep fighting for medals at the 43rd World Chess Olympiad. However, unexpected failure in the 8th round changed their plans. Firstly, two main favorites became visible in the tournament table, China and Ukraine. They have been in the top 3 for the recent years. Secondly, in the top of the list there is a great density, so the teams, fighting for medals, can’t afford to lose not even points, but the additional points as well. There is a great chance that additional points will be counted in the end. Unfortunately, out team doesn’t have a good situation in this matter, because opponents manage to do more. In the 9th round Women’s team’s opponent was Mongolia. Elizbar Ubilava’s team desperately needed winning, they had to defeat the opposing team convincingly, not only with the points, but psychologically as well. Fortunately, it turned out exactly like this – 3:1. Nana Dzagnidze’s victory and Nino Batsiashvili’s draw happened simultaneously. Soon after that Bela Khotenashvili’s opponent stopped the watch and one more point was added. Lela Javakhisvhili agreed on a tie with white figures. Now the most important is analyzing the results and tomorrow’s round, which will determine much. The opponent teams’ points are also important, but most of them are in our advantage. China is the leader of the tournament table and is considered as a future champion. Georgian team gained 14 points and will have to compete with one of the opponents tomorrow in the 10th round. The second team agreed with Serbia on 2:2. The third team got defeated by Vietnam – 0,5:3,5. Men’s team defeated Belarus – 2,5:1,5. Nino Gurieli gave Baadur Jobava a chance to rest and intead of him Mikheil Mchedlishvili played on the first board. The only game of our team was won by Ivan Cheparinov with black figures. Others ended with draw. It should be mentioned, that Cheparinov is the only one who didn’t concede his games. Out of 8 games he has 4 wins and 4 ties and is the best in our team. With this win Georgian team will have 12 points and will improve their position a bit. However, it will be hard to change the big picture in the next 3 rounds. Unfortunately, our men lost many unpredictable points, which excludes the chance of improving the results. The second team defeated Latvia with 2,5:1,5, the third team defeated Algeria – 2,5:1,5. All three of the men’s teams won, all of them with the same scores.